Saxophone Blog – Saxquest News | Saxquest | Step Up to Yamaha with rebates on new purchases! Step Up to Yamaha with rebates on new purchases! If you’ve been thinking about buying a Yamaha saxophone, Now’s the Time!! 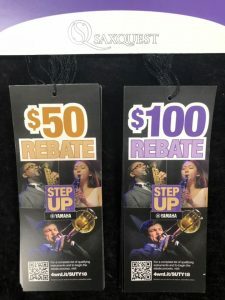 Saxquest is offering a $50 rebate for intermediate model instruments and a $100 rebate for professional model instruments. Take the Yamaha plunge at Saxquest.